Easily change icons and cursors on your computer, adjust and tweak Windows icon settings, and even animate icons on your desktop! Quickly customize any icon displayed within the Windows environment. One elegant dialog allows you to change icons anywhere on your computer. Just right-click on the icon and select "Appearance" from the popup menu. Animate icons on your desktop! On Display lets you select ANI files (animated icons) when you use it to change icons on your desktop. Select from several desktop animation options: animate ANI icons only when they are selected, or one at a time in rotation, or animate all ANI icons at once. 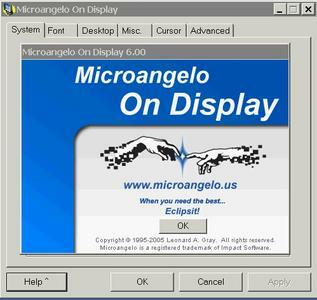 On Display overcomes several problems that occur when running under Windows XP. When you place your desktop icons where you prefer, Windows XP may move them all back to the left side of your desktop. When you change the icons for desktop objects like My Computer, Recycle Bin, and Network Places, Windows XP may set them all back to their defaults. Use On Display when you make changes to your desktop icons and put and end to both of these annoyances. Select the icon images that you prefer, rather than the default icons displayed by Windows. If you can't change an icon with On Display, it can't be done. Folder, shortcut, shell or system icons, On Display can change icons in more places than any other tool available.